Suburbia does not inspire when you first see its box. It looks like something you might expect to find as a spoof environment item in Fallout 4. It’s got the look and feel of something designed in the 80s. Look at the ‘happy’ couple on the box. The box of the damned. Now look a little closer. Look at their cold, dead eyes. Look at the grimness of their jaws. Look at the stiff set of their shoulders. These are two people that would rather be dead than play this game. The only thing they want is the cold embrace of the grave. Pay attention to how she’s looking at him. ‘Are we going to do it then? How are we doing it? I do you and then do myself? Or the other way around? I think you should do me, because I’m a terrible shot’. Look at his face. ‘Yes, darling. Let’s escape from it all. There’s nothing for us there’. 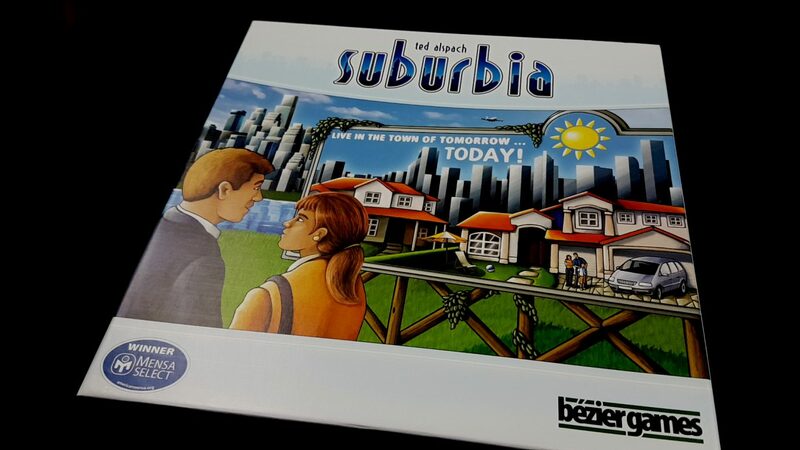 But don’t kill each other, little people – actually, Suburbia is an absolute gem of a game and you’ve got a treat awaiting you if you just give it a chance. Once you open the box, you can ignore all that faux-50s aesthetic of the cover and enjoy a game that is impeccably designed, with a clean and attractive playing environment. It’s not beautiful to look at, even at its best – but the art style visually striking without being complicated. It’s got a fair bit of setup for the first game, but once you’ve got everything bagged up later games are quick to get going because Suburbia is actually quite a simple game. Well. It’s got simple rules. But we’ll get to that – simplicity is only skin deep in Suburbia. 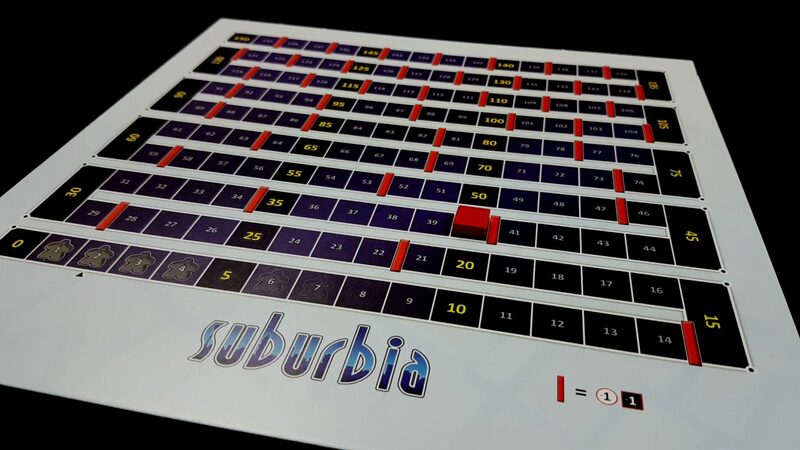 Suburbia is a semi-abstract game of city building, where you and all the other players (up to four) are independently building little suburbs of one large city. You do this by buying zones, and placing them in your own individual city grid. Each zone has an effect on the game – some impact only on the zones adjacent to them, some impact on all the zones of a particular type in your suburb, and others impact on every matching zone across the entire city. Each zone you place can change the strategic value of every other zone in the game, and the best part is that it’s retroactive – clever planning and careful plotting may result in you laying down a truly game-changing tile at just the right time – one that enriches you immensely while it impoverishes your opponents, breaking the back of the civic economic engine they have been constructing for themselves. It’s very hard not to feel almost unbearably smug when that happens. Look, it gets better. It honestly gets better. The hexes are your slice of the city – you’ve got a nice suburb, where people stay. At least for now. Then you’ve got a nice park, where people play. At least for now. And then you’ve got a heavy factory, where large sluices render down the corpses of the dead to make the nutritional slurry that forms 95% of the caloric intake of the people in your borough Look, times are tough. We all have to make savings somewhere. Above the suburb itself is the scoring track. The cylinder represents income – you start off with fifteen million cooling its heels in your treasury, and each turn you’ll get another chunk of money equal to your income. But be careful – if it goes negative you’re in deficit and you’ll need to actually pay out money every turn. If you can’t pay money, you need to lose population. I’m not sure, thematically, what that symbolises, but I’m betting it’s nothing good. At best, it’s austerity induced emigration. At worse, well – let’s just hope you don’t have a suburbs next to a train line next to the sluicing factories. It gets better! Seriously, it gets better! Now, this is more interesting than it looks – see all those red lines? They represent economic choke-points caused by the growing need for a civic bureaucratic infrastructure. When you pass each of those, you lose one population and one reputation from your score chart. They’re brakes, in other words, on economic and social development. If you slip back the other way across a red line, you *gain* one population and one reputation point simulating an alleviation of civic pressures. It’s very clever, because it has the effect of creating diminishing returns of progress without necessitating heavy-handed ‘welfare mechanic’ intervention. It also means you need to plan for success, because if you don’t it’s going to kill you. Okay, I lied. It doesn’t really get better. Every turn, you can buy a property – each zone has a price tag on it, and you can pay its price-tag plus its marketplace cost to buy it and place it in your city. The fancy restaurant for example has a face cost of $9m, and it’s in the +$6m slot of the marketplace. So, you can buy that for $15m if you like. Once it’s bought, all the properties left of it will shuffle up a slot and become cheaper, and a new property will enter the queue at the +$10m marker. 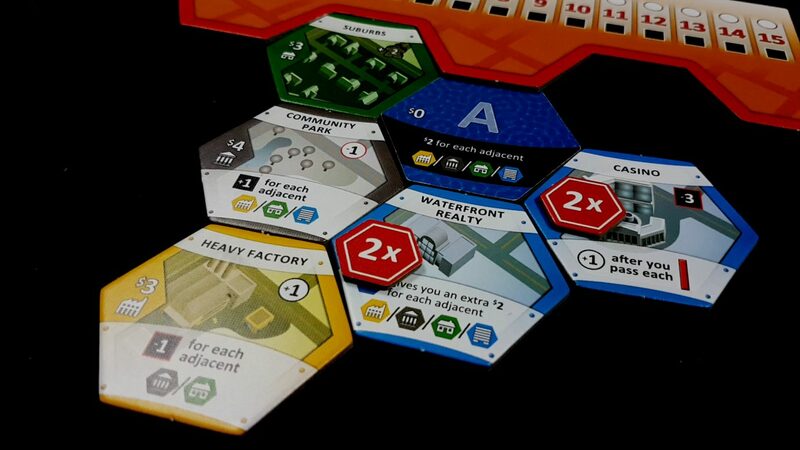 Or, you can buy one of the set number of standard tiles – suburbs, heavy factories and community parks. If you do that, you also trash one of the properties on the real estate queue by paying its real estate value. You can trash the convenience store or the mobile home community for nothing, but if you want to trash the cheapest airport it’ll be another $8m, thanks. So if you see something you really want, and you know someone else really wants it, but you can’t afford it and you know they can…. well, I’m not advocating that you scorch the tile and salt the land where it once lay. But you could. If you can’t have it, why should some other undeserving fool? A beautiful lake. You need to use your imagination. Lakes are great, because they are a straight up cash injection, presumably funded as a result of shady-deals involving legitimate businessmen with Italian accents. For each industrial. civic, residential or commercial zone surrounding a lake, you get a cool $2m right in your coffers. So placing this tile gets me $4m, which is a nice cash boost. If it were surrounded by more tiles, I’d get even more. Hey, fuggetaboutit. After I’ve bought my property, I collect my income (currently zero), move on my population counter (currently one) and that’s my turn! And also, that’s the game! 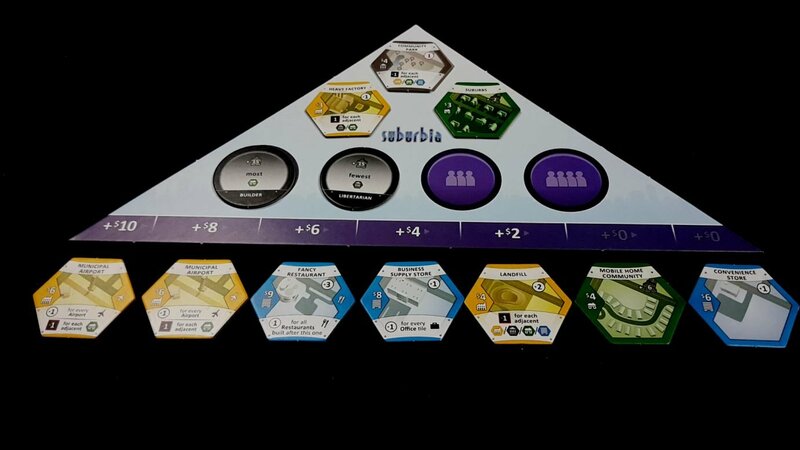 Aside from scoring, which consists of your population, plus a portion of your money, plus extra points awarded for meeting certain goals (both public and secret), that’s the entirety of how Suburbia works. It’s like really being there. Forget it, it’s commercial town. The parking lot gives me another +1 to my income, which is nice. And then I get a further +1 because it’s adjacent to the office building. That’s also nice! But then the office building gets me *another* +1 because it’s suddenly adjacent to the parking lot! And the community park gets me another +1 reputation because that’s now adjacent to another commercial region. So, one tile, intelligently placed, gets me some pretty great benefits. And that’s what Suburbia is all about. So, look at what we have now. Any time I place a commercial building in my suburb, I get an extra $2m in my coffer because that’s what my mint does. My fancy restaurant gives me +3 income, but every restaurant built after it gives me -1 to my income – and that’s restaurants across the entire city, so every time I or one of my opponents places a restaurant, I lose a point of income. BUT, I have a slaughterhouse, which means that any time someone plays a restaurant I get a +1 to my income. That means that every restaurant that is played is actually a net zero. However, the balance of that might change as other people play other tiles. My waterfront realty gives me an extra $2m per tile per lake, which is nice – so the lake I played as my first turn generated a total of ($2 + $2) x 4 – $16m for the tiles adjacent to it, rather than then $8m it could have. Now, imagine that kind of state management spread over potentially four players. Now imagine it over 20 tiles. At the last few stages of the game, it would be remarkable if things didn’t get missed as you played on. It’s okay, nothing is so critical that the game will crash and burn if you forget it. But it really is a lot to keep track of. 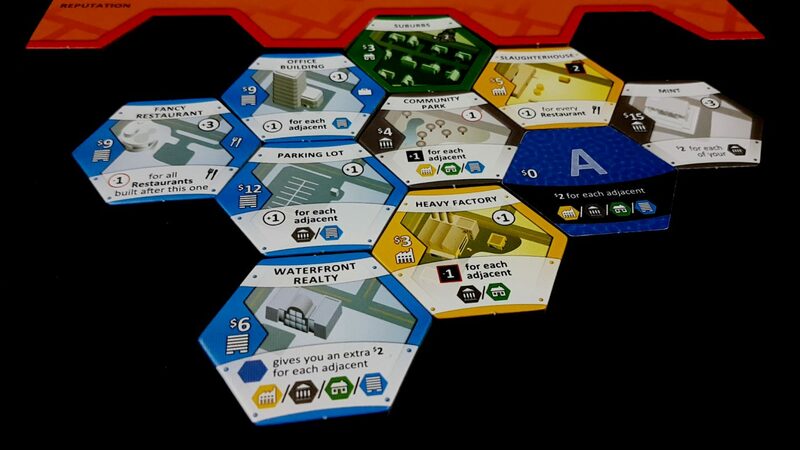 So, I have an investment token on the Waterfront Realty, which means that each lake gives me $2m + (2 x $2m) for each adjacent tile – $6m per tile. That’s significant amounts of money to be able to plop down per turn. The casino has an interesting effect – it gives +1 to income every time we pass one of those decelerating red lines, so rather than losing an income we hold steady at zero. But with the investment token on it, I take a one time reputation hit of three, and then from that point on I *gain* an income every time I pass a red line. The brake pedal becomes an accelerator. Essentially, the city becomes funded off the backs of the credulous masses. Place a second casino, stick another investment token on it, and you’ve got yourself Las Vegas. 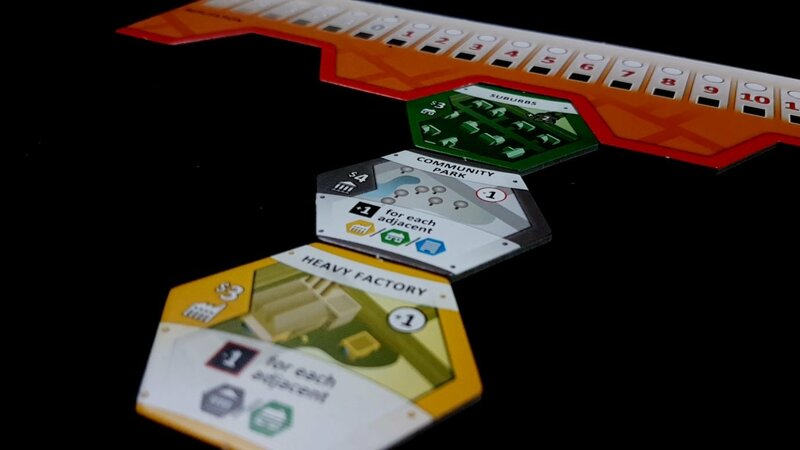 When we do our accessibility tear-down of Suburbia, this compound stacking complexity will be a big feature of the discussion we have around the cognitive costs of the game, but there’s no denying that it is an incredibly satisfying game mechanic. It rewards creativity and cleverness – if you’ve carefully constructed the absolute perfect place to put down a killer tile, you’ll be rewarded for your ingenuity. You can create credibly game-breaking strategies, but it’s fine because the red-line system ensures that unless your opponents are tremendously passive the only thing that will happen if you get too far ahead is that you’ll end up lumbered with additional costs and reputational problems until you grind to a halt. 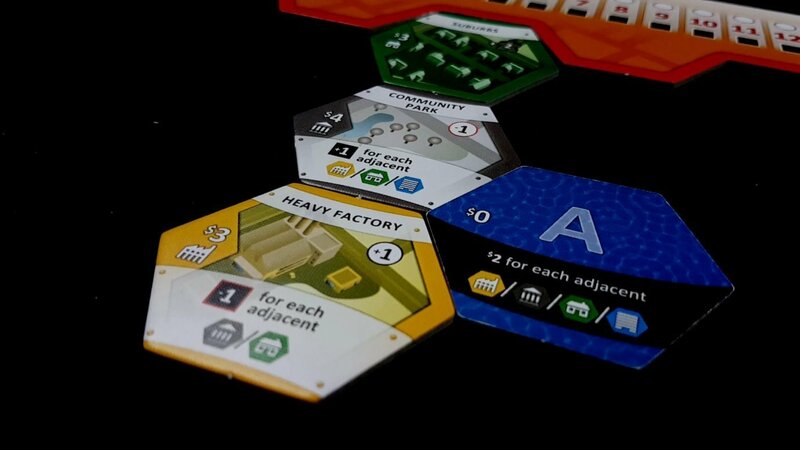 Later tiles focus on short-term one-time boosts to population rather than sustained infrastructure, meaning that even an opponent that is incredibly far behind can trash their own city in exchange for the victory points that population represents. 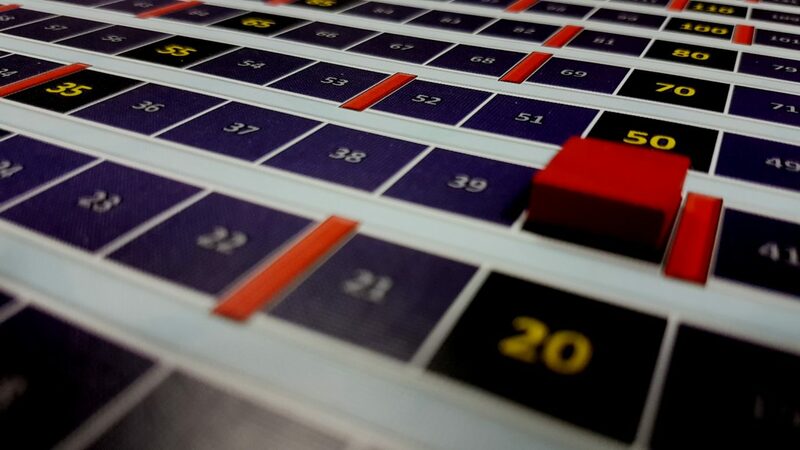 The game ends when a ‘one more turn’ token is played into the auction house, and you’re never entirely sure when it’s going to appear – that gives a very nice ‘can I make up the gap before time runs out’ tension to the end-game. That’s an excellent additional twist of tension in an already extremely pacy game. No matter where you are on the scoreboard, you’re never *out* of the game, but leave it too late and you might just lack the necessary momentum to sail past your opponents. 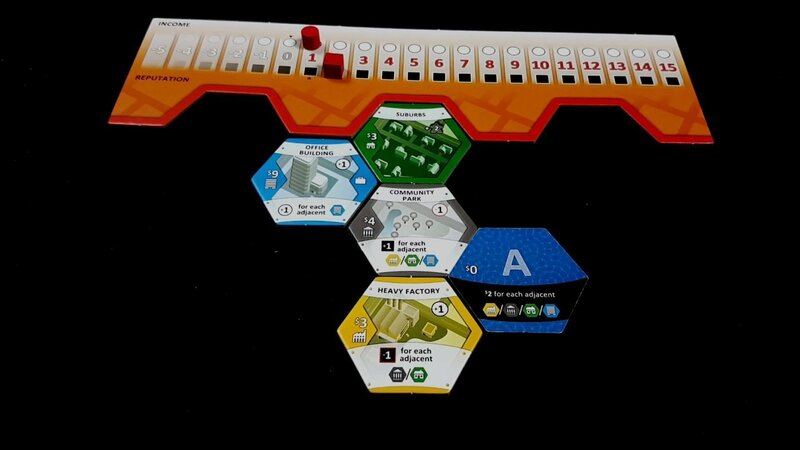 Suburbia is extremely excellent – okay, I lied about the attractive visual design but you need to look past that. I know it hurt when I lied to you, but I only did it for your own good – look past the ugliness and there is an absolutely stunning game in here, full of beautiful design and exciting game-play that rewards creativity and cunning. There are few games out there that let you feel truly smart as you place down a tile in such a way as to create an effect so powerful and so sustained that it looks like borderline bug-abuse. Fewer still that are also so well balanced as to ensure that by the time you’ve realised just how badly you’ve assassinated your own economy with early success it’s already too late to easily fix it. Every turn matters, every zone is hugely important, and every single move you make can be the difference between winning and losing. 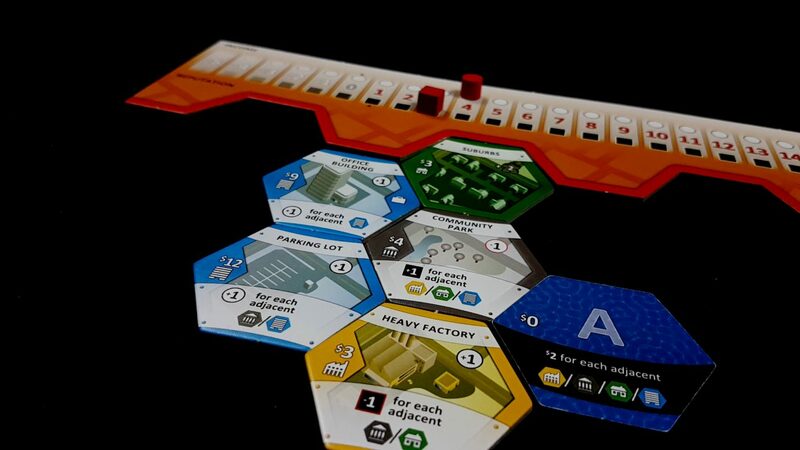 If you’re good at Suburbia, you’ll know whether you played well or badly at the time you lay down the tiles. The rest of us only notice the noose we placed around our own necks when our opponent kicks our chair away. Suburbia – get it. Sound of the summer. A real gem in an unassuming cardboard wrapper.